Tim Ghianni, born in 1951 at the peak of the Baby Boom, has lived life the best way he could figure out at the time. He is a career journalist, having spent about 34 years in daily newspapers as a reporter, editor and columnist before being “bought out” when newspapers began to falter. He continues as a freelance writer for various publications in Nashville, where he lives, and for other outlets around the country. He’s also “journalist-in-residence” at Lipscomb University in Nashville, Tennessee, where he enjoys helping students improve their writing. He is an author. 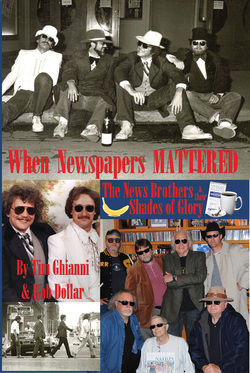 When Newspapers Mattered: The News Brothers & their Shades of Glory, co-authored with his friend Rob Dollar, details lives spent in newsrooms. Ghianni also has an eBook – After the flood.... – a gonzo, stream-of-consciousness chronicling of how Nashville’s 2010 disaster affected his family. Much of his freelance writing involves music, a primary interest ever since he first began buying 45 rpm jukebox discards for a nickel when he was a kid. Other interests include reading, watching NFL games, feeding the wild birds in his backyard, and going to the occasional ballgame or concert. He and his family – wife Suzanne and children Emily and Joe – live in a quiet middle-class section of Music City with their dog, Roxy, and cat, Champ. What would you say if you knew your mom was going to die in a few hours? Tim Ghianni found his own answer one night as he stood in a dimly lighted Critical Care Unit and talked to the dying woman who had given him life. He knew he didn’t have much time, but he wanted to tell her how her own life had helped shape his. So he started talking, not really knowing what was going to come out, reeling off memories from his childhood, from his youth and as an adult. Each memory spurred another memory. He reminded her of his incarceration – at the hands of his brother – in Davy Crockett’s cabin, for example. And the time she caught him and a toddler pal doing Evel Knievel tricks near a deep canal. And the resulting switching she always regretted. As the bedside monologue continued, for the hours in which his mom was still with him and the monitors showed life, Ghianni spun out the tale of his own life, one lived to the fullest (although not always healthiest), a Baby Boomer’s existence, and described how she influenced it. There are The Beatles, George Bailey and Elvis as well as going where the buffalo roam, a bit of Easy Rider in a Ford Falcon, the death of a pesky mosquito, Thanksgivings with grandparents, childhood mischief and The Rolling Stones. The nearly lifelong tussle between mom and son over his long hair is revisited as are his own near-death experiences on the football field. There are malt-shop memories and college-age indulgences. No secrets, of course. It’s a warts-and-all life and he’s proud of most of it. Mostly he’s proud to have been raised by this woman who taught him, among other things, the love of the English language that led to his own career in journalism, the career she abandoned to raise her two boys. And there’s a roll-call of pets, from those in his parents’ home – including a crippled sparrow who sings to the ailing woman daily – to those Tim has taken in. And, of course, there are the storms of life. But mostly there are great joys, like the two Romanian children Tim and his wife, Suzanne, adopted. It could be called a tale of death, but it’s really not. It is a tale filled with warmth and laughter, with life. Mostly love. Tim is also the co-author of two books with Rob Dollar.